Description: Minnie and Daisy now have their very own bounce house! 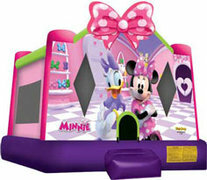 Join Minnie Mouse and Daisy Duck in their beautiful pink and purple bounce house. This bounce house is perfect for any Minnie Mouse party. Your little girl will love seeing Minnie Mouse and Daisy Duck on this bounce house.